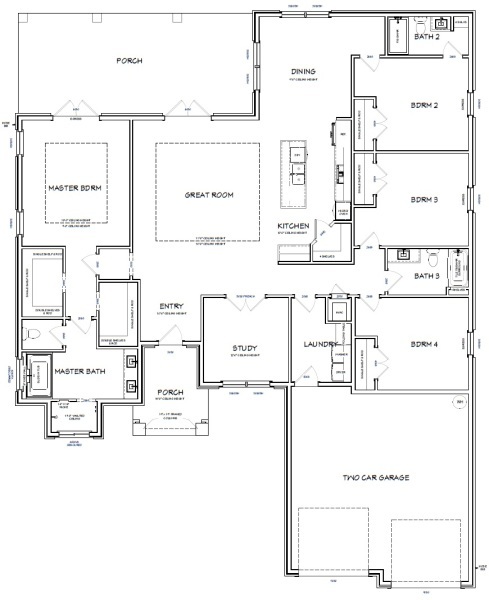 The Annaliese is a split floor plan geared towards a more contemporary style home. There are four bedrooms, three bathrooms, a study, and a separate laundry room with a large pantry. The home has three perfect size bedrooms on one side of the house and two baths. Bedroom two has a full size bathroom attached and bedrooms three and four share a hall bathroom. The kitchen, dining, and great room are open concept. The master bedroom is large and has beautiful French doors that open to the back porch and trey ceilings. The master bath has two walk-in closets, double vanity, tiled shower, and a garden tub. The home comes standard with crown molding, trey ceilings in master and great room, as well as granite counter-tops. At 2,567 square feet, this house is the perfect home for a family.